SAVOUR‘s largest edition this year, will be happening on 17 to 20 November 2016. Held at SAVOUR Grounds (next to Marina Bay Sands Exhibiton Centre), the non-ticketed event will showcase creations of the 10 DBS Live Your Dream finalists as well as the very first Christmas Food Market. 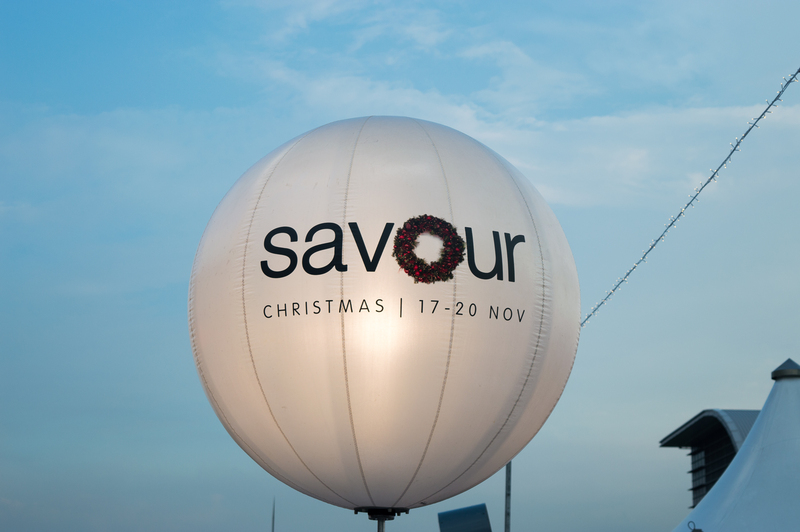 With so many events and activities in Singapore all year round, should you visit SAVOUR Christmas? Yes, you should and below are 10 reasons why. 1. Free entry for everyone as it is the season of giving but still must pay for food lah! 2. Savour over 30 dishes from 12 top restaurants at affordable prices (between $6-$12). Check out the menus here. 3. Launch of the very first Christmas Food Market where you will get to feast on goodies that are specially flown from all around the world. Think Hokkaido Lavender Soft Serve, Iberico Suckling Pig, London Roast Duck and many more! 4. The Christmas Market will also house everything you need for your own Christmas parties. No more last minute shopping. Hooray! 5. Love the smell of fresh pine? The event will feature a 6m live Christmas Tree. The largest in Singapore yet! 6. Support your favourite young emerging chef from 10 restaurants at the Gourmet Village as they battle it out to be the first ever winner of DBS Live Your Dream. d) vote for your favourite Martell pairing. 8. Live entertainment as you eat and drink your way through the event. More details here. 9. Stand a chance to walk away with Christmas party packages, bottles of wines, Christmas goodies and more by participating in the carnival games like ‘Toss a Ring‘ and ‘Throw a Can‘ at the event. 10. Wide selection of beers, spirits and cocktails at the SAVOUR Bar. What’s more, there is a 1-for-1 cocktail promotion during happy hours from 7-8PM daily at L’Espace Martell. A peek inside the Christmas Food Market. An array of premium sausages and deli meats by Indoguna. Iberico Jowl Char Siew with Aglio Olio ($9). A must try! Iberico Shabu Shabu for your home parties! Here, you can feast on more than 30 creations by the 10 finalists of the DBS Live Your Dream initiative at $6 or $12 per dish. Check out some of the dishes from each team below. 1. Post on Instagram using the hashtag #LYDVote(chef’s name). Every post with the hashtag counts, so remember to post and set your Instagram account to public for the votes to be counted! 2. Each person will be given a voting ball at the entrance. All you have to do is to drop your voting ball into the voting box at the DBS Live Your Dream area. So, eat, snap and vote for your favourite chef and help him/her achieve his/her dream! With so many food and activities at SAVOUR Christmas, I’m pretty sure it’s gonna be fun! So, bring your friends and family along and feast away! See you guys there!